Randy Brown’s piece “Fighting Seasons” appears in Midwestern Gothic Issue 17, out now. As a transplant—no matter that I’ve lived, studied, and worked here since the late 1970s—I’m always careful to say that I claim Iowa as a home state. Through my grade school years, my father was active-duty Air Force, and we moved around a lot: California, Florida, Japan. Military children have a surprisingly complex relationship to seemingly simple questions, such as “Where are you from?” Do you mean where I was born? Where were we last stationed? Where our family maintains legal residence or home-of-record? Because my father left active-duty when I was in sixth grade, I got the best of both worlds: I learned how to pull up stakes and make friends in strange new places, but also got to graduate from the same high school at which I’d started. I swore I’d never stay in Iowa after I graduated high school, but I did. I also swore I’d never join the military, but I did that, too. My big city high-school graduating class was more than 300 students. I was also later able to experience small town Iowa for a few years, working as a community newspaper editor and reporter. From there, I moved on to edit national magazines about commercial and residential construction. (Think “Better Homes and …”) I also joined the Iowa Army National Guard, and served as a citizen-soldier for 20 years. In addition to an overseas deployment, I got to see Midwesterners at their best, responding to blizzards, tornadoes, and floods. 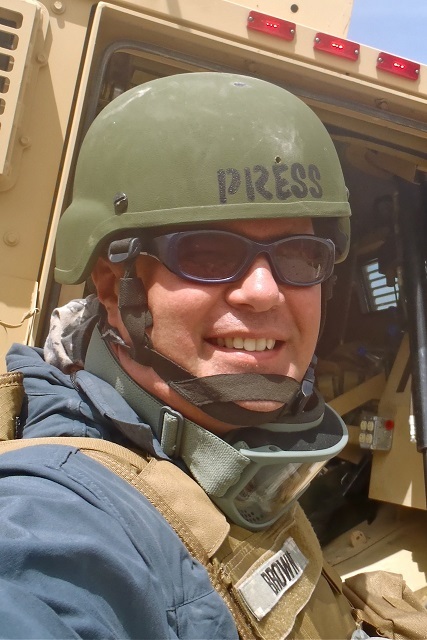 After I retired from the military, I embedded as civilian media with an Iowa unit of more than 3,000 citizen-soldiers deployed to Afghanistan. Many of those were friends and buddies. As an historian and journalist, I wanted to explore the who, what, where, when and how of transporting a number of Iowans equivalent to the population of Huxley, Iowa halfway around the world. I also wanted to be able to tell kids why it was necessary for their citizen-soldier mothers and fathers to leave them for more than a year of their young lives. I’m still working on the answers. The Midwest is a blank slate. The Midwest is a flat tone. The Midwest is a private place. The Midwest is a speed bump. The Midwest is a rolling hill. The Midwest is a small town. The Midwest is a constant horizon. The Midwest is a great place to be from. Much of my current research and writing regards the U.S. 34th Infantry “Red Bull” Division, a National Guard unit that has historical roots in Minnesota, Iowa, and North and South Dakota, as well as other Midwestern states. The unit’s distinctive shoulder patch is a red bovine skull superimposed on a black Mexican water jar called an “olla.” The patch was designed in 1918 by artist and citizen-soldier Marvin Cone, who was then deployed with the 34th Inf. Div. to New Mexico while preparing for World War I. Notably, Cone was also a friend and colleague of regionalist painter Grant Wood. Both were from Cedar Rapids, Iowa. I joke that there may be just as many present-day copies of Cone’s “Red Bull” design in Minnesota and Iowa as there are of Wood’s “American Gothic” painting. Thousands of Minnesota and Iowa National Guard soldiers still wear the patch. When I was still in uniform, people in airports would chat up the patch. The Midwest is a moveable feast. It was great to be able to wear that Red Bull patch on your sleeve. From Atlanta to Afghanistan, both civilians and fellow soldiers would know where you were from, historically and geographically. And they’d want to talk. The Midwest would find you. As a construction writer, I learned to break down a building into systems: Structural, Mechanical, Electrical, Plumbing, Communications, Security, and Fire Protection. As a graduate student of architecture, I studied the Usonian houses of Frank Lloyd Wright—small, residential, allegedly affordable homes. The archetype of the American ranch house. The kitchen as central workspace. The attached carport. These are notable buildings, but they’re sometimes hard to preserve as homes. After all, in an age of McMansions, most people don’t aspire to live in a historically significant two-bedroom home. In my academic explorations, I considered a house as an architectural object, one that exists on a cultural landscape. Change the purpose of a given object—turn a single-family residence into a rental property, say, or into a house museum—and you cause ripple effects in the surrounding community. You change the cultural, economic, political, and historical interconnections of a place. You change the landscape. I still consider myself a journalist—an observer, a reporter of fact, an interpreter of events. But I’ve found poetry is my way of considering an object or experience—and maybe just a fragment of one—and connecting it something larger. When someone types “-30-“? That’s an old newspaper practice. Seriously, however: Nothing against edits and revisions, but, if you don’t learn to hit “send,” you’ll never see it in print. Newspaper deadlines taught me that. I’d also encourage readers to seek out the annual anthology series “Proud to Be: Writing by American Warriors,” published by Southeast Missouri State University Press, now in its fourth year. I’ve encountered a lot of fellow Midwestern voices through those pages. Keep in mind, this isn’t about “writing as therapy.” This is about veterans engaging their communities through poetry, fiction, non-fiction, oral histories, and the visual arts. We need to bridge the gap between civilian and military. I also plan to attend the second Military Experience & the Arts Symposium, at which veterans, writers, artists, dancers, and others exchange ideas on how to communicate their military experiences through their arts. The first event was held 2012 in Richmond, Ky. This year’s event will be May 14-17 in Lawton, Okla. I tell people it’s going to be like Woodstock meets Boot Camp. Finally, in addition to my non-fiction projects, I’m working on a chapbook of my military-themed poetry, and have work forthcoming in War, Literature & the Arts; O-Dark-Thirty; and a couple of war-themed anthologies. At the Red Bull Rising blog (www.redbullrising.com), I write about ways people can celebrate, remember, and support military service members, veterans, and families. Much of my coverage involves encouraging both writers to document and share their experiences through writing, even if it’s just for themselves or close family members.